This is the time of year we bask in the warmth of the sun and in the joy of witnessing new plant and fungi growth. Many individuals and families enjoy hiking through the woods or fields as this is a way to help forget the cold, snowy days of winter; for others it is a time to unleash the urge to be out there and forage. Unfortunately, the urge can be so powerful for some foragers that their greed becomes more important than following the rules of sustainable harvesting and this is cause for alarm if we want to preserve many species for our children and grandchildren to enjoy in years to come. Mycorrhizal fungi coexist with trees. The fungal mycelium, together with the tree roots, forms a mycorrhiza (fungus-root). This network of roots and mycelium increases the surface area through which trees can take up water and nutrients. In return, the mycelium gets nutrition from the tree. Both the trees and the fungi depend upon this partnership for survival. This is important to keep in mind when foraging. Do not rake or dig into the forest floor unless you are hunting for truffles so that you are not unnecessarily disturbing the mycorrhiza. Be positive of the identity of the fungi if you are collecting it for food so there is not a chance of you getting ill.
Do not remove or disturb moss layers where more mushrooms are continuously growing. Pick only what you will use. Cut the stem with a knife. After you cut the mushroom, tap it slightly so that some of its spores will be released. Place in a loosely-woven basket so that as you walk more spores may have a chance at returning to the soil. There are many plants out there that you can harvest and not have to worry about sustainability issues because they are prolific reproducers. The mustard family is very hardy and no one will fault you for taking as much garlic mustard as you want because they are invasive. In fact, you’ll not only be getting a plethora of nutrients in your diet from eating these, but you’ll be helping other plant species to have a chance to grow and thrive. Before you go out foraging for plants, be sure you learn what can be taken in abundance and what should not. The best example of what not to harvest lots of is wild leeks. Wild leeks, or ramps as some people refer to them, must be harvested sustainably. There is nothing more heartbreaking than to see a person walking out of a forest with a bag (or bags) full of wild leeks. Wild leek seeds take two years of warmth and cold in the soil before they can germinate. The bulb overwinters, and it is photosynthesis and the nutrients in the leaves that allow the bulbs to grow. The entire life cycle lasts anywhere between five and seven years, which means when you discover a batch of wild leeks with full, plump bulbs, those are the end product of several years of growth, not to mention a laborious germination process. When you harvest large, mature plants, take ONLY a select few and leave a good swath of leeks behind. Never rip tiny plants with small leaves out of the soil – these are far too young to produce seeds and must remain in the earth. Treat yourself to a couple of bulbs, only take one leaf per plant and take only what you need within reason. Nowhere has the impact of overharvesting been more detrimental than in Quebec. In 1995, foraging of wild leeks for commercial purposes was banned in the province and the plant was listed as a vulnerable species. Under the ban, anyone caught with more than 50 bulbs is subject to a minimum $500 fine. 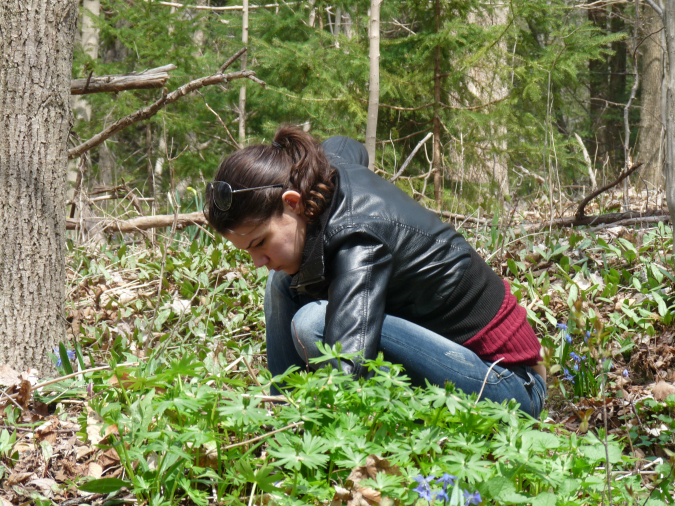 Quebec is not the only place that limits wild leek harvesting. In 2004, parts of the Great Smoky Mountains National Park in North Carolina and Tennessee banned the harvest of ramps after a study found the only way to prevent damage to the patch was to harvest less than 10 percent each year. So no matter what you set out to forage this year, please do your research to ensure that what and how much you collect will not cause harm to the eco-system. Sustainable harvesting will ensure that our grandchildren will not have to learn about these edible wonders from a history book. This is such an important topic. There are so many people being introduced to foraging right now and no matter how many times experienced foragers warn of sustainability, it can’t be said enough. We all have our horror stories of unethical or uneducated foragers ruining a sustainable crop. Thanks for the post.